Poster published by the Louisiana Lesbian and Gay Political Action Caucus (LAGPAC) announcing extended voter registration hours. The Louisiana Lesbian and Gay Political Action Caucus (LAGPAC) was created on August 8th, 1980, by a group of activists committed to attaining legal and social equality for Louisiana’s gender and sexual minorities. Based in Alexandria, LAGPAC was a political organization that investigated the beliefs and stances of candidates running for public office and, through mailing lists, editorials (The Voter’s Guide and The Lagniappe), and phone banking, galvanized its members to vote for candidates that were supportive of the LGBTQIA community. Meanwhile, it aimed to sway the larger Louisiana population to support equality for the state’s gender and sexual minorities. At its peak, LAGPAC also had chapters in Baton Rouge, New Orleans, and Acadiana, and made a significant impact on numerous elections. LAGPAC ceased operations in 2002, but Equality Louisiana is considered a successor of the organization. "The Only Safe Closet is the Voting Booth!" "Bring something with your signature, i.e., Driver's License, cancelled Check, etc." 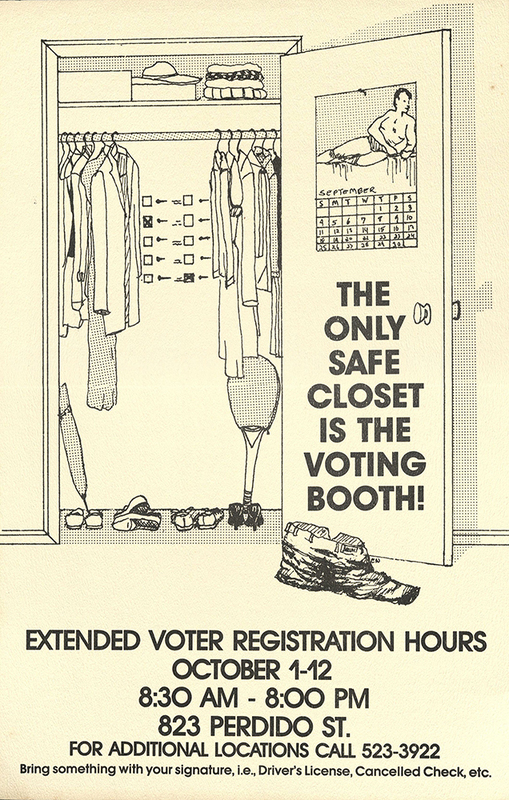 “Louisiana Lesbian and Gay Political Action Caucus (LAGPAC) Voter Registration Poster,” Social Welfare History Image Portal, accessed April 26, 2019, https://images.socialwelfare.library.vcu.edu/items/show/343.